The Annie Schildhauer collection provides an intimate look at family, architecture, interiors and fashion in Victorian Wisconsin (between 1885 and 1900). Public interest in photography grew exponentially during those years. Previous conventions established the practice as mere documentation, however with its growing popularity photography gradually grew into a new venue of artistic interpretation. Technological advancements such as the transition from glass plates to flexible film prompted simpler methods and smaller cameras, which paved the way for many individuals, men and women, to dabble in the new art of photography. Late 19th-century Wisconsin boasted a plethora of Victorian details. With memories of the Civil War still fresh, the style of the time was playful — with whimsical ornamentation, and a taste for the eclectic. The collection held in the Society's library and archives consists of 47 album pages mounted with four to six gold-toned contact prints mounted on each page. These snapshots encompass various landscapes, both rural and domestic. The 149 images of Victorian-era Wisconsin focus on Victorian-genre scenes and interiors. Among her prominent friends in Madison, Annie photographed the ornately decorated interiors (and exteriors) of the homes of such friends as Wisconsin State Treasurer Sewell A. Peterson, State Fish Hatchery Supervisor James Nevins and Judge A.S. Zimmerman. In addition to these telling Victorian details, Schildhauer captured the vitality of the city of Madison. Her visual documentation of the University of Wisconsin-Madison offers a window into the bustling and budding campus. For example, photos of the dedication ceremony and interiors of the Red Gymnasium provide a glimpse into the new architectural wonder. Perhaps the most poignant photographs come from Schildhauer's warm and colloquial portrayal of her family and friends. From recreational shots of the family's camping trips, to the indoor portraits of her brother-in-law, Edward Schildhauer, Annie captures her subjects with precision and care. Annie Sievers Schildhauer was born to German immigrants Peter and Margaretha Sievers on August 13, 1860, in New Holstein, Wisconsin. At the age of 19 Annie married Henry Schildhauer on February 11, 1879. 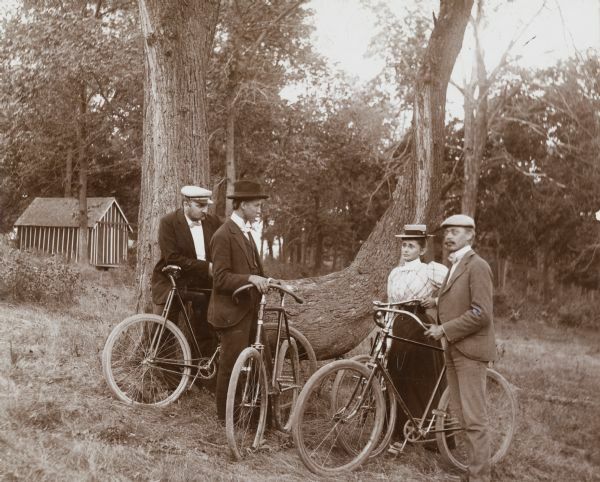 Traveling with her husband to Colby, Wisconsin, and then to Madison, Annie tended to the house and devoted herself to taking photographs of her surroundings. The Schildhauers' time in Madison proved fruitful for Annie's blossoming photography endeavors. Due to her husband's public job as a state official in the Department of Revenue office, Annie and Henry lived an upper-middle class lifestyle in Madison. Although her time in Madison was limited, Annie left a collection of photographs that showcases Madison's Victorian charm, both in its buildings and citizens. Sometime after 1900 Annie and Henry moved to Idaho and settled in Boise. Annie and Henry lived in Boise until her death on February 27, 1924.